The original Italian-American restaurants of late 1800s San Francisco have had an enormous impact on the flourishing culinary scene we see in the city today. Such restaurants attracted not only wealthy diners, but middle class workers, immigrants, and bohemians alike. Many of these local establishments, such as Coppa's and Campi's, had a family-like ambiance that created a community of regular customers. These restaurants' popularity eventually turned them into iconic eateries, and through this popularity came a flourishing of San Francisco's economy as well as a public interest in food that is still alive in present-day San Francisco. Savoring the delicate blend of quattro formaggi atop a dish of fettucine which lingers upon one's palate long after the olfactory nerve has been tantalized by the full-bodied garlic aroma of a provincial cacciucco, connoisseurs have long known that at the epicenter of the Italian heritage is a reverence for food akin to religious piety. Steeped in centuries of traditions, the provincial cuisines, i cucine, of Italy have combined the ambience of family ties with an aesthetic simplicity that in 1990 has enlivened the culinary arts. Beginning in the 1890's, the decade which marked the great immigration of southeastern Europeans to the United States, the descendants of Italian provincials kept sacred their ancestors' recipes. In recent years, the growing awareness of provincial Italian cuisines due to travel, the ease in importation of authentic Italian ingredients, and heightened interest in high carbohydrate/low fat foods that are nutritionally sound and economically affordable have attracted the non-Italian public to provincial Italian cuisine. Outside the home, la cucina casalingua, the homestyle cooking of the provincial kitchens, was seasoned in osterie, inns which were nothing more than modest boarding houses, and trattorie, restaurants that opened in the numerous Little Italys that marked the immigration trail of Italian provincials across the United States. 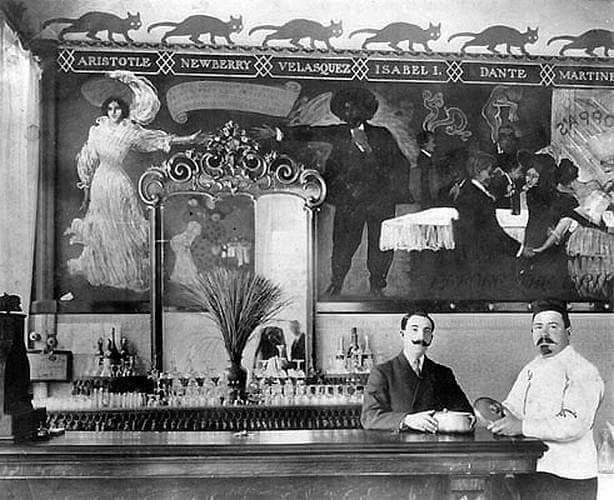 In San Francisco, a city born in the excitement of the Gold Rush of 1849, and a city noted for its gourmet restaurants, the Italian provincial restaurants served their clientele provincial dishes in a congenial atmosphere that reflected the tenet universal among all Italians that food and the pleasure of eating meals shared with relatives or friends remain essential to maintaining kinship ties. For Italians, the quality and quantity of food eaten by a family has always symbolized the economic earning power of the menfolk and the family's social position guarded by the women. Equating food with family life was the formula recreated in San Francisco's osterie and trattorie(4), where patrons felt the reverence Italians demonstrated towards their cuisines. Pioneers themselves, San Francisco's first Italian restauranteurs introduced the city to the cucine of northern Italy. Although the city's Italian community was small from the 1850's through the 1880's, it was the largest in the United States, and characteristic of the pattern in Italian immigration, it was dominated by provincials from northern Italy until the 1890s. San Francisco's Italian colony was comprised basically of four provincial groups from Genoa in Liguria, Lucca in Tuscany, Cosenza in Calabria, and Palermo in Sicily,(6) as well as a significant number of provincials from Piedmonte, an area of Italy well known for producing discriminating cooks. (7) Catering to the specific appetites of this varied patronage, there was a blend of hearty foods which aimed to satisfy all the provincial palates. Ravioli and cioppino' 'for the Genoese; beans, fagioli—the love of the Florentine—along with rigatoni and grilled meats or a veal rag'u, for the Tuscan palate; saltimbocca for the Romans; rise e bisi, rice and peas, served with scampi for the Venetians; bollito misto for the Piedmontese; and zabaglione(8) from Sicily—these delicacies not only pleased the various provincial tastes, but in a far corner of the American West, Italian proprietors laid the groundwork for a restaurant industry which contributed to San Francisco's recognition as a gourmet city. At the same time, these restauranteurs set the stage for social interaction with a society represented by the cosmopolitan tastes of a transient frontier community that hailed from around the world. It was a clientele that possessed what San Francisco writer Helen Throop Purdy described as "gold and silver in plenty and [who] were prodigal in spending it . . ." (9) Notable among these pioneers were seven provincial Italian restauranteurs: Frank Bazzurro, Giuseppe Campi, Stefano Sanguinetti, Frank Luchetti, Guiseppe Coppa, and Angelo Del Monte. Each paved the way for successive generations of Italian restauranteurs who continued promulgating the Italian heritage through the medium of food. 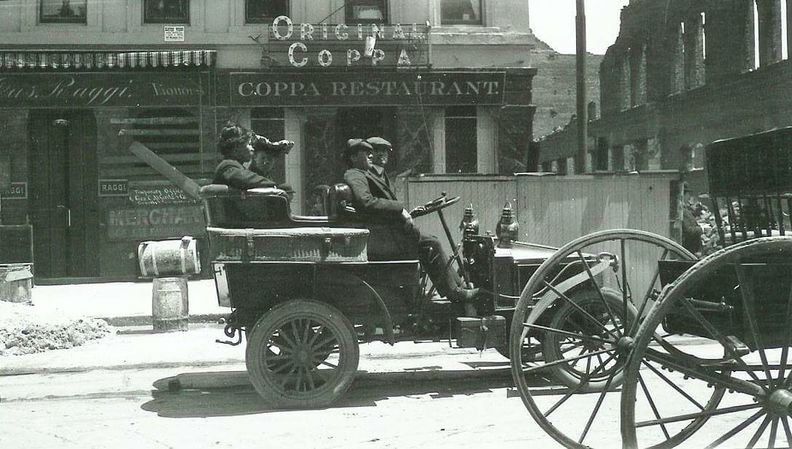 Original Coppa's exterior with passing Model T-Ford, c. 1908. Bazzurro moved his restaurant from this waterfront location twice, once because the area was reclaimed by the city and the land filled in, and the second time because of the destruction caused by the 1906 earthquake and fire. (11) Bazzurro relied upon bountiful resources from the bay and the city's outlying truck farms to prepare his provincial specialties. The city's Italian restaurants followed suit in catering to the gargantuan appetites of their own clientele. An average lunch cost twenty-five cents — "two bits" -- and followed the classic Italian menu, beginning with either soup, spaghetti, ravioli or macaroni; followed by a choice of entrees — tripe with sausage and beans, meatballs, stuffed zucchini, kidney stew, and veal saute or scallopini accompanied by vegetables. Dinner, a seven-course affair, cost fifty cents and included a green salad — served at the beginning of the meal to please the American palate instead of the end of the meal in the Italian style — and a platter of antipasto — salami, olives, celery stalks, raw carrots, and green peppers. Ribsteak and chicken were two specialties on the regular menu that raised the dinner tab. Meals ended with fruit, dessert of either pastries, zabaglione or fried cream, and a demitasse. (15) Of course, wine — red or white — was included in the price of the meal. As the city spread out from the waterfront towards Montgomery Street, which became the financial and commercial district, and along Broadway bordering Little Italy, Italian restaurants opened their doors. Offering menus that were inexpensive, in a word cheap, their informal home cooking, la cucina casalingua, captured the gastronomical hearts of San Franciscans. Attracted to an exotic, ethnic atmosphere of a restaurant that served heaping platefuls of inexpensive food and wine, the city's artists and intellectuals introduced the Italian provincial restaurants to the middle and upper classes. Penetrating society's upper crust through their art works, Bohemians Gelett Burgess and Kathleen and Charles Norris, whose early courtship was conducted over "many a little table ... in the ... Italian Quarter where we used four dollars' worth of light on each fifty cent meal,"(25) transmitted to San Francisco's American-born population their discovery of immigrant provincial Italian cuisines. 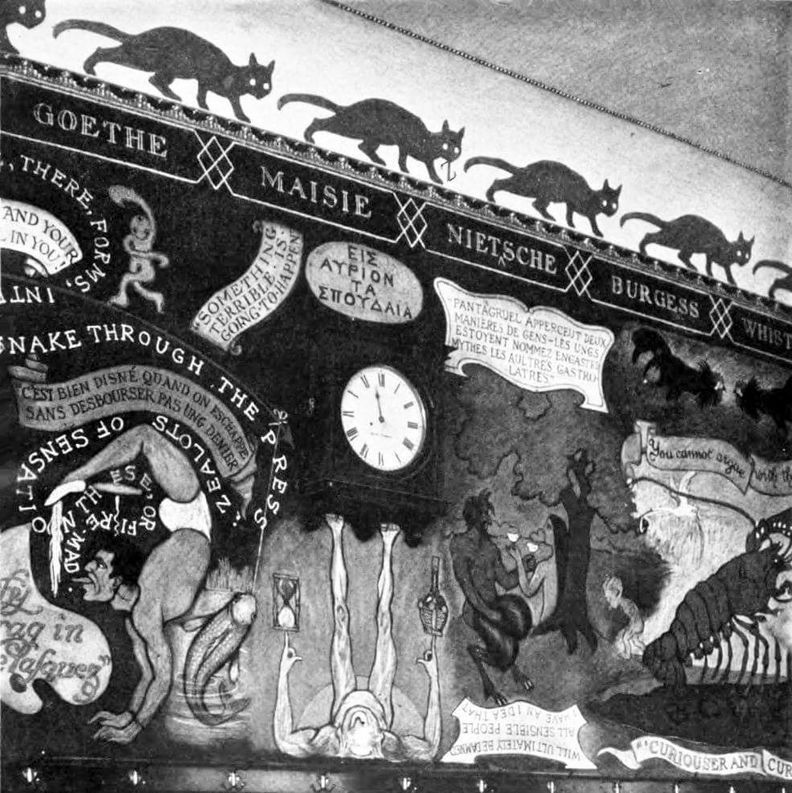 Original Coppa's famous interior mural. Dining at Coppa's in its heyday, early 1900s. The original Coppa's Restaurant was a long, narrow room on the ground floor of the Montgomery Block. It had a high ceiling with chandeliers and an inviting expanse of bare wall. Three rows of seven tables filled the dining room. Felix, Coppa's partner, tended the ornate bar while Coppa, the chef de cuisine, ran the kitchen. A four-bit table d'hotel consisted of salad, pasta, entree, crusty sourdough bread, black coffee, and a bottle of wine. Coppa's became too popular with the Bohemians, and this ultimately undermined its success among the local Italian clientele. 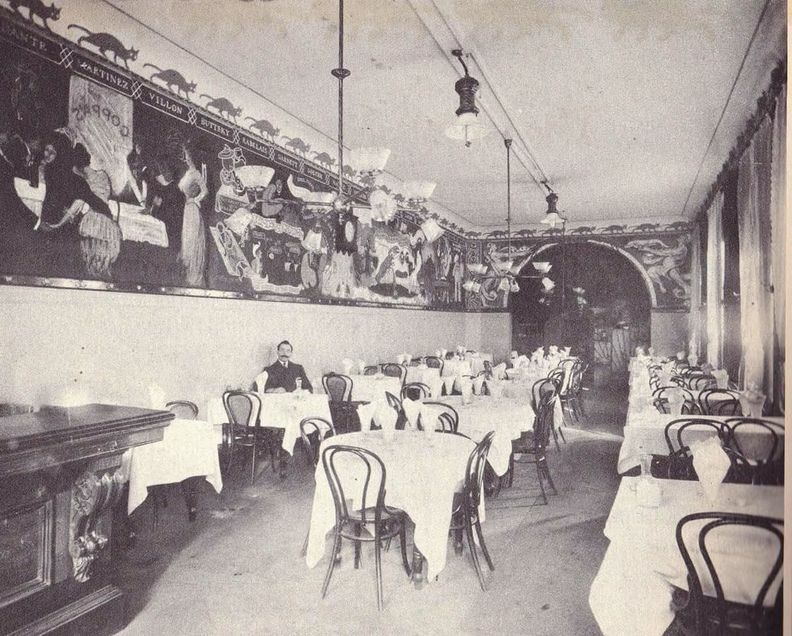 While the Bohemians had created a haven for themselves, persuading Coppa to return to his looted restaurant after the 1906 earthquake and fire to cook a "last supper," the Italians took their patronage to the less crowded and inexpensive restaurants that opened along Columbus Avenue, the main thoroughfare of the Italian colony. (35) Although Coppa's survived the earthquake and fire, the landlord raised the rent, forcing Coppa to relocate, and thereafter open a series of mediocre restaurants. The fanciest Italian meals came from the Fior d'Italia, which opened at 504 Broadway on May 1, 1886, under the proprietorship of Angelo Del Monte. Specialties of the house that first year included risotto with clams (ten cents); tortellini (five cents); veal saute (five cents); and squab casserole (forty cents). Double porterhouse steak-an American dish-was sixty cents." Del Monte took in a partner in 1896, a young immigrant known to his customers as Papa Marianetti, from Maggiano, a town between Lucca and Pisa. Like other Italian restaurants, the Fior d'Italia was a family operation with Marianetti's two sons, George and Frank, who shelled peas, bused tables, and washed dishes after school. The "Fior," as the restaurant was known among San Francisco's Italians, became the Italian community's "in" spot, where important family events--weddings, baptisms, anniversaries, birthdays, and first communions--were celebrated. The Fior d'Italia, presently across from Washington Square in front of St. Peter and Paul Church, is the city's oldest surviving pioneer Italian restaurant. Certainly Bazzurro's, Campi's, Sanguinetti's, Lucchetti's, and the Fior d'Italia were not the only prominent Italian restaurants in San Francisco before the turn of the century. But they were the most popular among discriminating local Italians and Amcrican bon vivants. These six restaurants laid the groundwork for a gastronomical industry that has profitably contributed to the economic structure of San Francisco. By 1900, when the influx of Italians increased, North Beach had become an eating paradise--at workers' prices. Italian restaurants stretched along Columbus Avenue from Montgomery Street to Francisco Street, along upper Grant Avenue, and along almost every side street between Chinatown and Fisherman's Wharf. 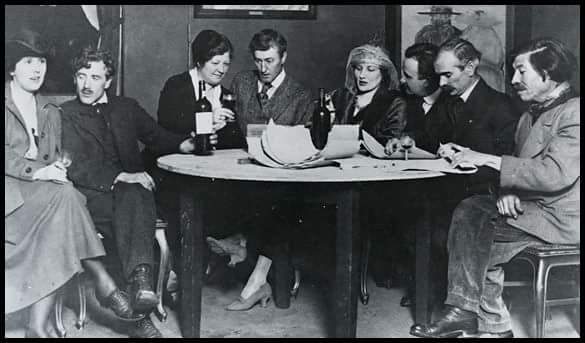 The Prohibition, which prompted the avocation of basement wine-making among a majority of Italians, the Great Depression, and World War II saw a transformation in San Francisco's restaurant industry. By the 1950's, almost one hundred years after the first Italian restaurant had opened in the city, San Francisco's restaurants were recognized by Holiday Magazine, then noted as the guidebook of gourmets, for their understated excellence in the culinary arts. (39) Building upon the traditions established by the provincial Italian restauranteurs of serving an abundance of food in a congenial atmosphere that made diners feel they were dining and not just eating, these newcomers, among which was my father's restaurant, Paoli's, vigorously competed for Holiday's coveted four-star awards. Immigrating from an agrarian-based country, where the energies of its people went into the production of food, to the United States, a country whose consciousness of food was yet to be awakened, these provincial Italian entrepreneurs used their culinary expertise to create a restaurant industry that contributed significantly to San Francisco's economy. 1. National Restaurant Association Research and Information Service Department, "Consumer Attitude and Behavior Study. Consumer Preferences of ethnic Foods In Restaurants" (March, 1984), p. 25. 2. Waverly Root, The Food of Italy (New York, 1971), p. 12. See also "Introduction," pp. v-xii. 3. Ibid., p. 13. Marcella Hazan, Marcella's Italian Kitcben (New York, 1988), p. 3. 6. Dino Cinel, From Italy to San Francisco (Stanford, 1982), pp. 21-22. 7. Deanna Paoli Gumina, The Italians of San Francisco: Gii Italiani di San Francisco 1850-1930 (New York, 1978), P. 19. 8. Root, pp. 7, 35, 44, 84, 115, 325, 405,407. 9. Helen Throop Purdy, San Francisco As It Was, As It ls, and How to See It (San Francisco, 1912), p. 151. 10. Doris Muscatine, A Cook's Tour of San Francisco (New York, 1963), p. 247. 11. The earliest listing of Bazzarro's 105 Pacific Avenue restaurant in any San Francisco directory was 1879. Langley's San Francisco Directory 1879-1880 (San Francisco, 1879), pp. 116, 1062. Also, Muscatine, p. 247. 12. "A Short Autobiography of Frank 29. Ibid. Marini Written on August 27, 1947. In deposit at the Italian Welfare Society, San Francisco, California. 14. Richard Dillon, North Beacb: the Italian Heart of San Francisco (San Francisco, 1985), p. 134. 15. Purdy, p. 151. Hazan, 25. Also, Jerry Flamm, Good Life in Hard Times (San Francisco, 1978), p. 51. 16. San Francisco Directory, 1859 (San Francisco, 1859), p. 326. 18. Purdy, p. 151. Also, Daniel O'Connell, The Inner Man (San Francisco, 1891), pp. 73-74. 19. B. E. Lloyd, Lights and Sbades in San Francisco (San Francisco, 1876), p. 64. 20. Langley's San Francisco Directory 1888 (San Francisco, 1888), p. 1406. 23. Roland Whittle, "The Humbler Restaurants of San Francisco," Overland Monthly, No. 41 (May, 1903), p. 365. 25. Kathleen Norris, Noon: An Auto-biograpbical Sketch (New York, 1925), p. 30. 26. Langley's San Francisco Directory 1874 (San Francisco, 1874), p. 819. 30. Jack L. Dodd and Hazel Blair Dodd, Coppas Restaurant, Bohemian Eats (San Francisco, 1925). In deposit California Historical Society, San Francisco, No. 4719. 31. Oscar Lewis, Bay City Bohemia (New York, 1956), p. 100. 34. Muscatine, pp. 228-229. Dillon, p.136. Also see Lewis, pp. 100- 106. 35. Gumina, p. 27. Columbus Avenue was formerly called Montgomery Avenue. 37. Muscatine, pp. 264-266. Flamm, pp. 54-56. 39. The reader is encouraged to read Holiday magazine's special edition on San Francisco. "San Francisco," Holiday, Vol. 26, No. 4 (April, 1961), p. 220.